Such a lovely basket! The pink against the red just pops! I especially love the contents! LOL! Thanks for sharing! This is so cute!! I love tutus. They are so girly and fun. Thanks for sharing your awesome gift basket with us at Merry Monday this week! i would have loved to have received this as a little girl. I love it! I love the way this looks! So creative and cute. Super cute basket! So easy for Valentine’s Day! Thanks for linking up to Merry Monday! Sharing on G+! Have a great week! 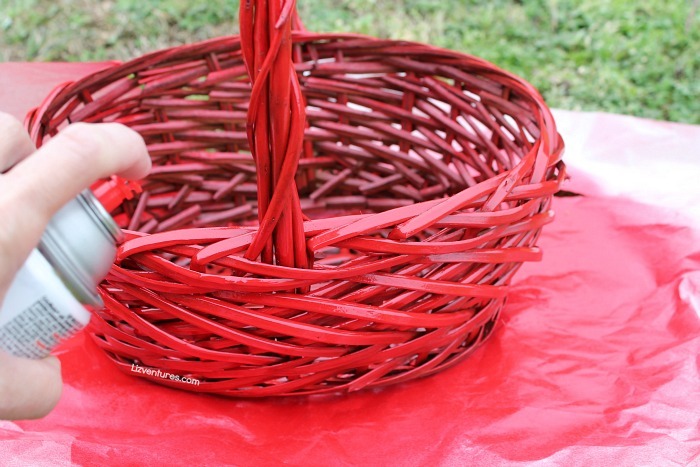 This is a really cute way to dress up a basket for Valentine’s Day. My aunt used to make my sister and I little baskets like this for the smaller holidays and they were always really exciting to receive. That tutu basket is so girly! I think this would be a cute DIY basket for a fun loving girl of any age! This is very cute, I love the colors and the added ribbon. The chocolate really makes this a sweet treat everyone in the family will love! That is adorable! I think I might have to run out and get some more tulle to see if I can re-create this. This basket is so cute! I love a good valentine’s diy! This idea is simple but amazing. This would make a fabulous gift for a loved one. Such a great and unique idea. Ooooohhhh! I want one! This basket is so cute and I love Hershey candy. My daughter would freak over this tutu basket. She would want to wear it though which would be funny to see! This is so adorable and surprisingly easy! I love this idea, thanks so much! 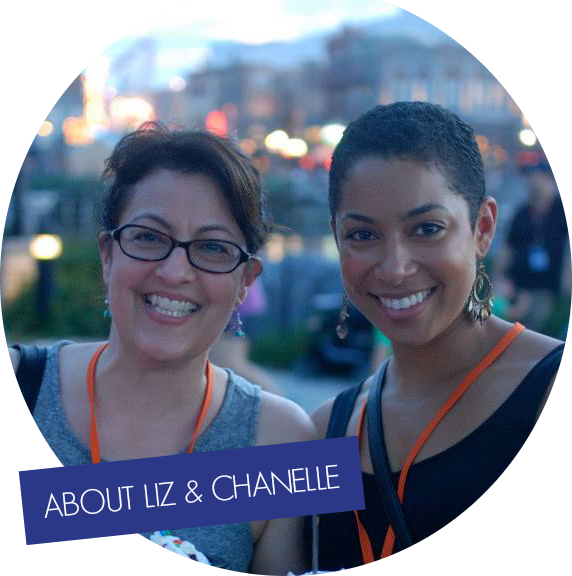 Liz, this is such a a great idea!! 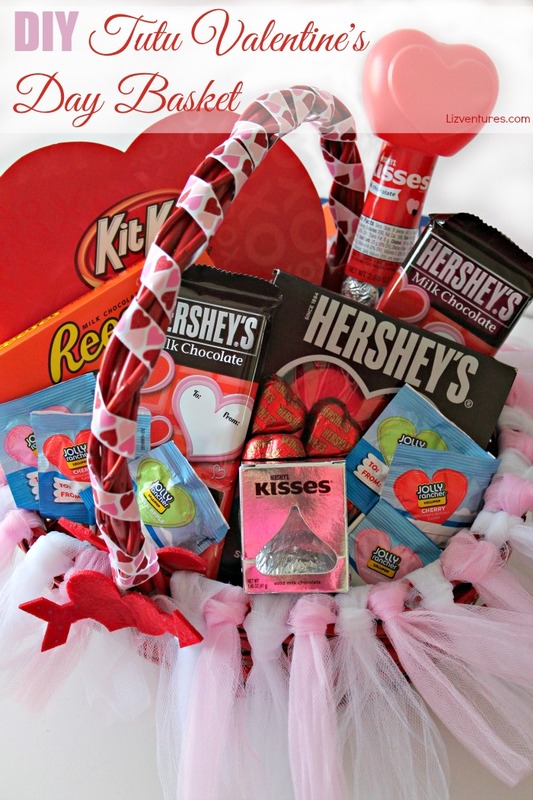 I love Hershey’s Candy and would definitely love receiving a gift basket like this. I love that you added the tule on it. I love this! The Tutu Valentine basket turned out great and so cute. I am going to put something like this for my little one. Any basket filled with giant Hershey’s kisses gets my vote! What a lovely basket, perfect timing. Definitely going to try it! this is so cute and what a great idea for something out of the norm! i think i’ll do this for my kids! This is such a great idea. I am going to try this out. I love that you have some great pictures showing the steps. It gives me more courage to try things. I love this gift basket design and beautifully done as well!! I love the tutu on the basket super cute and festive. This is so creative. Love the finished look a lot. Wow what an awesome craft! You are very talented. I’m going to have to make these for my nieces. They’d love it! This has got to be the cutest basket ever! I am in love with the concept and want to make my girls one now! That’s so clever, I love how the sprayed basket turned out. What a great Valentines present to receive! This is such a cute treat basket!! I would love to make one of these for my “secret valentine” at work!! 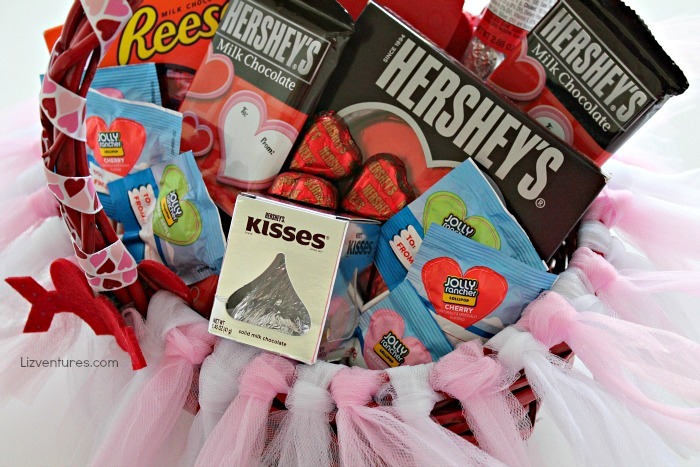 Love what you did with this Hershey’s Valentine’s giftbasket. Who wouldn’t want to receive something as pretty and tasty as that gift? what a great idea of valentines day basket! My friends will love this idea too… I will share with them!! 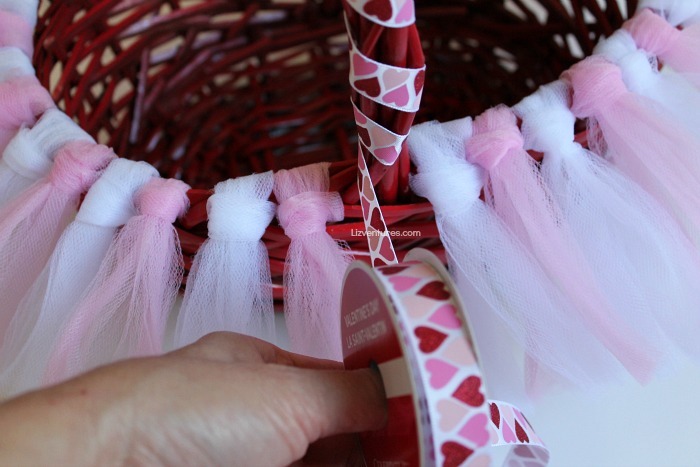 This is indeed an amazing DIY Tutu Valentines day basket. It is adorable and I will have to make this for my mom and sisters. Thanks for sharing the beautiful idea. You know me so well! Please send me chocolate everything! That basket is exactly what I’d hope for on Valentin’s Day. This is so adorable! My mom will love this, for sure. Can’t go wrong with a basket full of candy! It’s so cute! I’d love to make that. I like arts and crafts even if I’m not necessarily good at them. Wow, such creativeness! I wish I could come up with ideas like that. I do love to repurpose stuff around the house, but never as artistic as you’ve made that basket turn out to be. That’s SUPER cute! You totally transformed that plain basket! Wow that looks wonderful! Thank you for sharing such an amazing DIY. I would love to try this out. This is so cute! As a kid Valentine’s day was never a big thing for us, it was always an American thing, but I think it’s always good to have an excuse to treat kids every so often! This so cute and amazing. I would like to try that. This is such a fantastic idea, so cute and so creative! What a cute basket. Its absolutely a creative idea I’m so glad you share it. I agree! I can’t wait to try this. What an adorable basket! I love crafting! This is such a lovely idea. A great thoughtful gift. I’d love to get this. What a cute and fun idea ! My niece would love this ! What a gorgeous basket and I like how you made it look so pretty from scratch. Wow Liz, you are so creative! The tutu basket is so pretty. I’ve got to try this. This would be a great gift or a party centerpiece for Valentine’s Day. The personalized touch can really add more meaning to the basket. What a cute idea! I never thought of doing something like this. I know so many little girls that would love this. I love the look of this basket. I will have to try making one for Valentines day. I love making gift baskets. This is an adorable idea! I think I will do this for my daughters first easter basket! What an adorable DIY Valentines Day gift! Who wouldn’t love all of these treats in a tutu basket?! What a great basket! Looks really easy to make too, I bet my kids would get in on this to make. That is adorable – a tutu is genius! My daughter would love this basket. The basket is adorable, my daughter would love it now even though she’s all grown up! I’m pinning it for future reference. What a perfect basket for a little girl in dance. When my daughter was little she would have loved that. That’s awesome and adorable! Anyone who receives that gift basket would definitely feel loved! 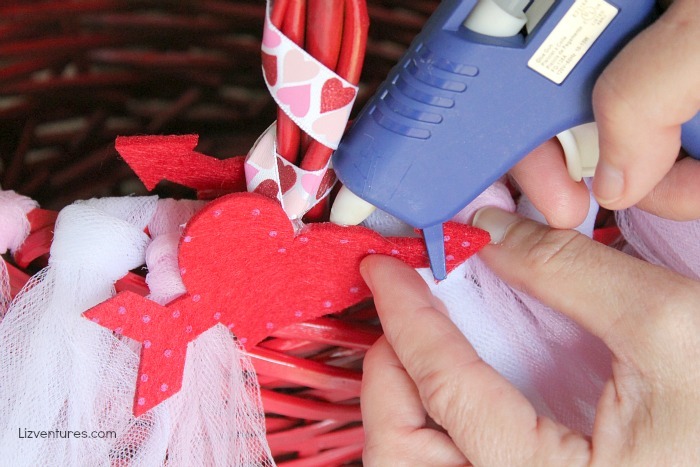 Your Valentine’s Day basket is awesome and I love all of the DIY touches you added. I know both of my girls would get a real kick out of something like this! Awe what a darling idea! My girls would love baskets like this for any occasion! This is so cute! The chocolate makes it even better! What an adorable basket! This is an awesome DIY, I’m a big fan of gift baskets, especially when they’re overflowing with chocolate! I love love love gift baskets. My family may be tired of them, but I may have to add this one to the list. Oh my gosh. This is so adorable, I love the tutu part of it. My girls would go nuts for these baskets. I may have to make these for them this year! Ahhh!!! So cute! I would love to get one of these! That is adorable and so simple too! It would be perfect to give a special gift in. SO darn cute! 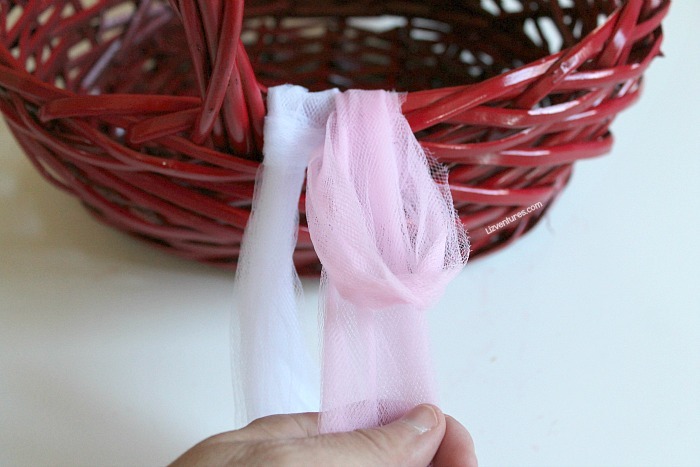 Love the idea of using tulle to make it more festive. Totally going to make this. That’s a clever idea. I’d thought you were going to make a tutu then pop it round the basket at first. This is such a cute little gift and nice and simple to make. I love making gift baskets. They are so more personal than other gifts. That’s beautiful and I’m a sucker for Hershey’s. I would be over the moon if I got this as a gift! I love the effect you got with spray painting the basket. I’ve never thought to do that. I’m definitely going to give it a go. Thanks for the idea! I am not talented in the crafts department. But this is one DIY craft that I think I could actually DO! And it’s so cute, too! This is got to be the cutest thing ever! My grand daughter would be over the moon!! You always have the best ideas! This is an adorable basket, I know my grand daughters would love it. The chocolate would be a winner too. I used to make my girls tutu skirts so I have A TON of tulle left over in my craft box. I’ve never really known what to do with it but this is absolutely perfect!! 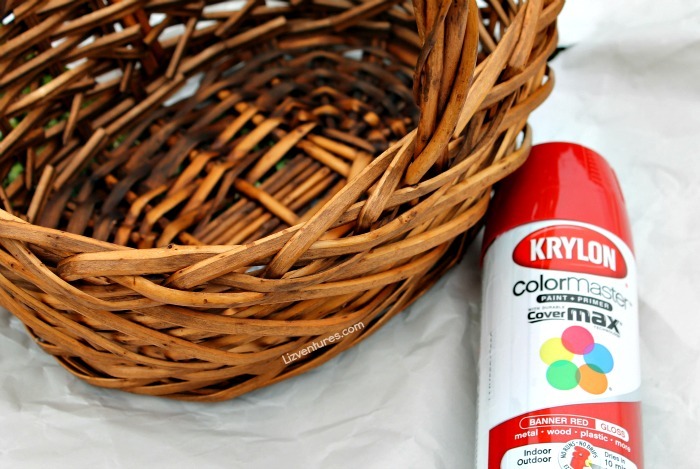 My girls would go crazy over this fun decorated basket and spray painting it? Icing on the cake! I love what you did with the tulle. This basket sure looks good! I love this gift basket! It’s so fun and festive! Adding the tutu is so clever! My daughters would LOVE this! What an adorable idea!!! A great way to make that Valentine’s basket of treats extra special. And quite doable, too! This is such a cute idea, I made a similar one for my daughter last Easter. Tutu is always a hit in my home. Oh my lands this is stinking adorable. What little girl wouldn’t love to get this for Valentine’s Day. 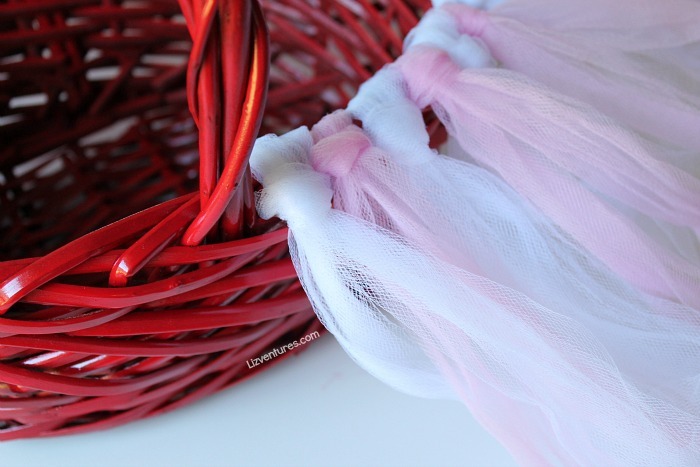 This Tutu basket is really adorable and would make for the perfect Valentine’s Day something for my girls. I love giving gift baskets because you can fill it with favorite items and this festive look is so cute! This is so cute! I love creative ideas like this! My nieces would really love this. That’s such a great basket. I love how you threw some cute little touches on it to make it extra special. What a super cute and fairly simple idea for Valentine’s Day! I love making and receiving homemade gifts best. My daughter would love this tutu basket. I would LOVE to get one of those. I love all of that candy – I would be in heaven! What a pretty basket! This is an awesome idea and I would love to receive a basket like this.